Who Despises the Day of Small Things? 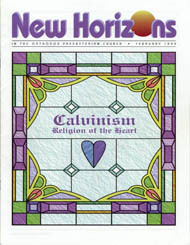 by Robert P. Harting, Jr.
We Presbyterians call our Christian convictions the Reformed faith. What do we mean by that name? And from where did the name come? We call our faith "Reformed" because of the Protestant Reformation. During the medieval era, the Christian church became more and more distorted. Truths taught in the Bible were obscured. Ideas and practices without biblical warrant came to prominence. This led to a movement by Christians to reform the faith and practice of the medieval church. It is from this effort at reform that our name comes: the Reformed faith. I intend to demonstrate in this article that the Bible teaches the doctrine of election. The Scriptures teach that God elects some, and not others, to eternal life, without regard to any worthiness (such as spiritual desire, religious merit, or foreseen faith) in those whom he elects. In doing this, God acts in accordance with his highest purpose, which is, as Paul states repeatedly in Ephesians, the revelation of his own glory. Potter and Evans were the starters for the 1932 championship game of the "Little Nineteen" intercollegiate league in which Wheaton College competed. Evansa future member of the Hall of Fame at Wheatonwas the natural choice to wrap up the series that year. He went up against Nelson Potter, who went on to pitch for the St. Louis Browns. While Potter made it to the major leagues, Wheaton won that day behind the consistent hurling of Clarke Evans.